Hi Everyone! Welcome to my blog! As you may or may not already know, my blog will be exploring the value of education by contrasting alternatives to college. My intention is not to convince you what to do with your lives, but rather to discover the answers myself. A couple years ago, I was a novice attempting to enter the world of higher education. I began typing vigorously trying to fill out every box as accurately as possible: mother’s name, father’s name, education, etc.….. The time had come; the moment I had been anticipating, college applications we’re due. In a couple of hours, I would have to press send, and leave the rest of my future in the hands of the college admission counselors. I tried to hide my flaws with my achievements; my worries with interests. With essay questions like, “Why would you like to attend our school?”, I feared that the admission counselors would see my bluff because truthfully, I had no idea. For me, college was never an option. I spent my whole life in a quiet city where it just about an unspoken rule that everyone goes to college. I had no idea what my interests were, and I was even more confused about choosing a major. I didn’t really know much about the mysterious college world, only that I wanted to go. I was able to compile a list of colleges that I was extremely interested in, but even so, none seemed to be an exact fit. Each school seemed to have a drawback. Some schools seemed too big, some too expensive and others too religious. I had been adding and removing colleges on a daily basis, but now it was time to make my final decision. After the arduous hours of working on my application, I took a last look through colleges. I came across Chapman University. For some reason, Chapman had a particular unexplainable impact on me. I remember my freshman year of high school, Chapman students came to perform for our band class. They weren’t particularly amazing, but ever since, the school has been embedded in my memory. Recollecting my experience with Chapman, I decided spur of the moment to apply to Chapman also. Over the next couple of months I anxiously waited for acceptance letters running to the mailbox everyday searching for large envelopes. Finally, a package came in the mail from Chapman University. 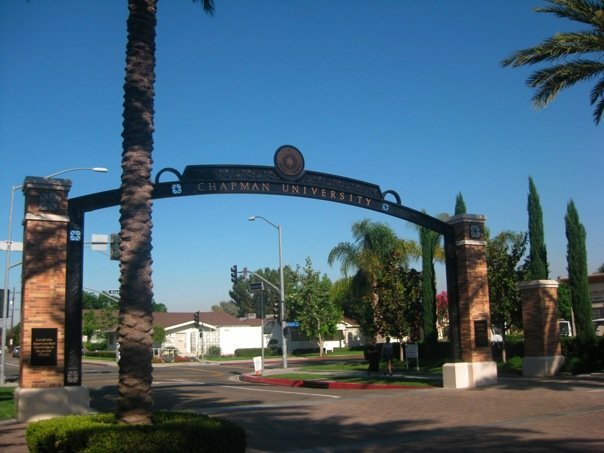 I was thrilled to discover that I had been accepted, but I had already set my mind on another school and had no intentions of attending Chapman. Within the next month, I continuously received ads, flyers, and pamphlets about Chapman. One day, I decided to look through the pamphlet since I never looked closely Chapman. Inside I discovered that Chapman was just the type of school I had been looking for. It’s a small university in Southern California with an extremely diverse academic program. The more I looked through the pamphlet, the more the school spoke to me. Even the students in the pamphlet seemed to have ambitions similar to mine. Ultimately, I decided to attend Chapman because of the music program, which I was interested in, as well as a rising science department. But even after deciding on a college, I couldn’t help but wonder. Did I choose the right school? What else is out there? It’s hard to forget that Chapman is a private college with almost double the price a public school education and more than 5 times the price of a 2 year college. Because of Chapman’s small size, I knew I was at risk of losing the resources of a large public university such as a large library. At the time nothing seemed to matter, I had already made my decision, and began the next step of my life. Two years later I’m sitting in my “Written Inquiry” class talking about how much it costs to attend Chapman (about $52,000), and the ridiculous new parking auction. It made me think, “What am I paying for? Have I gotten any smarter since entering college?” It seems that even after 2 years of college, the questions I began college with still remained unanswered. With questions still circulating my mind, I arrived at my Macroeconomics class where we begin studying opportunity costs. Putting what I was thinking about during English and what I was learning in Macroeconomics, I began to wonder what is the opportunity cost of going to college? I have already chosen how I want to go about my education, but I wonder, are there practical and successful alternatives to college? This entry was posted in Uncategorized and tagged chapman, college, education, expectations, finance. Bookmark the permalink. Don’t give up what you came here for, pursue music and disregard the other things that get in the way. Thank you for your support! I’m sure I can find a way to continue music without interfering with my education. Thanks for commenting on my blog post about college! I normally don’t return the favor (I’m too lazy)… But I really liked the idea behind yourblog and your first post piqued my interest! I think that I’ve learnt a lot since I started college… But the question is if I’ve chosen the right college, as opposed to if I should’ve gone to college. Eight months have passed since my first day… And I still have nagging doubts if this is the best place for me. Nevertheless, I guess it gets better. And I’ll be wiser when it’s time for postgrad. Everyone has the potential to create a successful life from the goals one sets for oneself to the achievement of those goals, even in the midst of financial and personal challenges. The purpose of your time in college is to develop your knowledge, broaden your life experiences and ascertain your strengths and weaknesses. You must then apply what you learn to your life and career with a big dose of common sense and discretion. Thank you for your comments. I completely agree with both of you; I believe that college does develop your knowledge, and it’s a once in a lifetime experience. However, I still wonder if there is value in not attending college? There’s value in a different perspective. Good blog you have got here.. It’s difficult to find excellent writing like yours these days. I honestly appreciate individuals like you! Take care!! Aw, this was an incredibly nice post. Taking a few minutes and actual effort to generate a really good article… but what can I say… I put things off a lot and don’t manage to get anything done. Hello, I think your website might be having web browser compatibility problems. Whenever I look at your website in Safari, it looks fine however, if opening in Internet Explorer, it’s got some overlapping issues. I merely wanted to give you a quick heads up! Apart from that, excellent blog! You ought to be a part of a contest for one of the finest blogs on the web. I most certainly will recommend this web site! Good post. I learn something totally new and challenging on sites I stumbleupon every day. It will always be helpful to read articles from other writers and use something from their sites.